April 1-2 2017, 2 day Freestanding Wall Workshop. 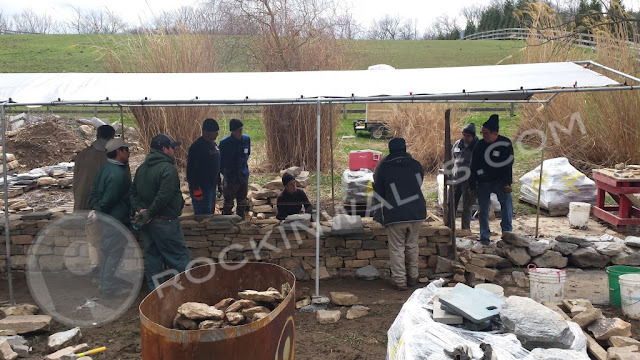 Rockin Walls Training Center hosted the first visiting instructor Mastercraftsman Neil Rippingale, DSWA-GB, DSC-US, from Scotland. 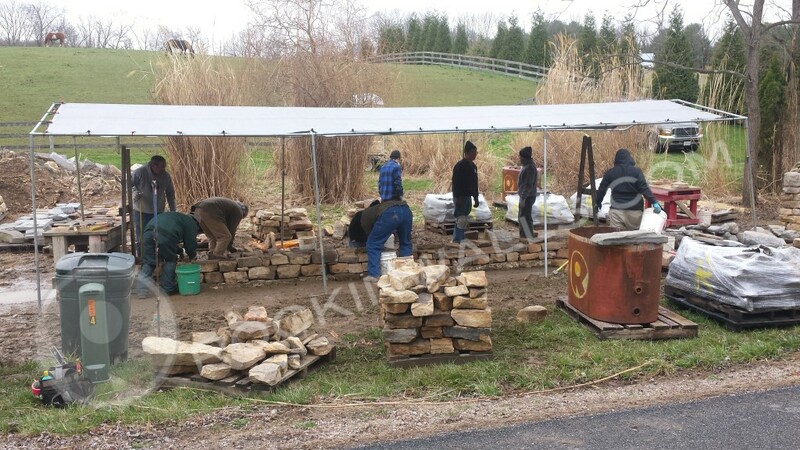 We had a full group of eager men and women ready to learn the craft of dry laid stone. After a quick slideshow presentation of proper building techniques from Neil, the group hit the ground running. 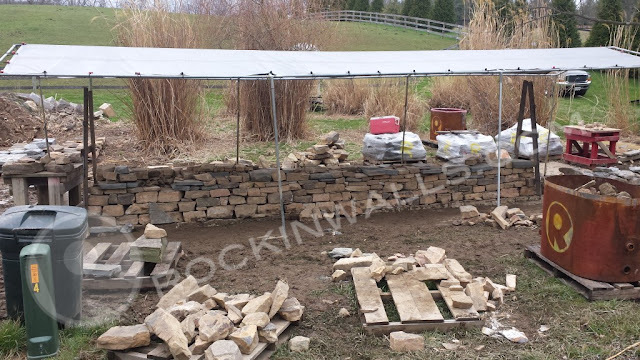 The task was to build a traditional freestanding dry laid stone wall. 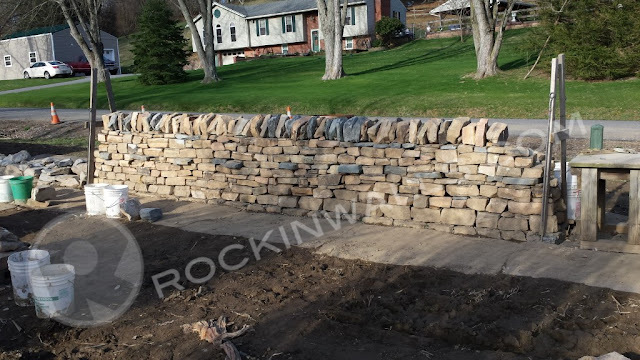 The stone of choice would be a flat bedded sandstone mixed with blue stone ties. With the threat of rain from the day before a nice shade canopy was set up. Just incase! Thankfully no rain came but the sun did. The added shade kept everyone moving and focused. As they learned to make good choices. Along with understanding some of the bad ones too. 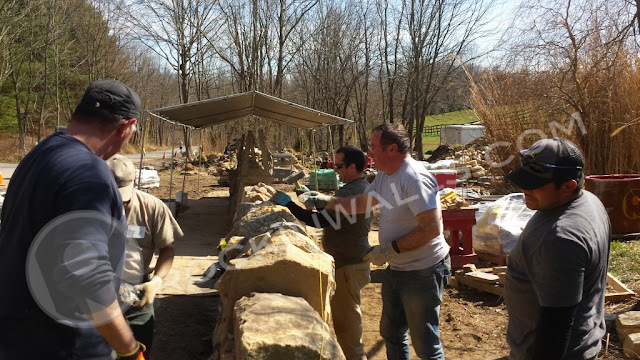 Mark and Neil worked both sides to help give each and everyone the best walling experience. 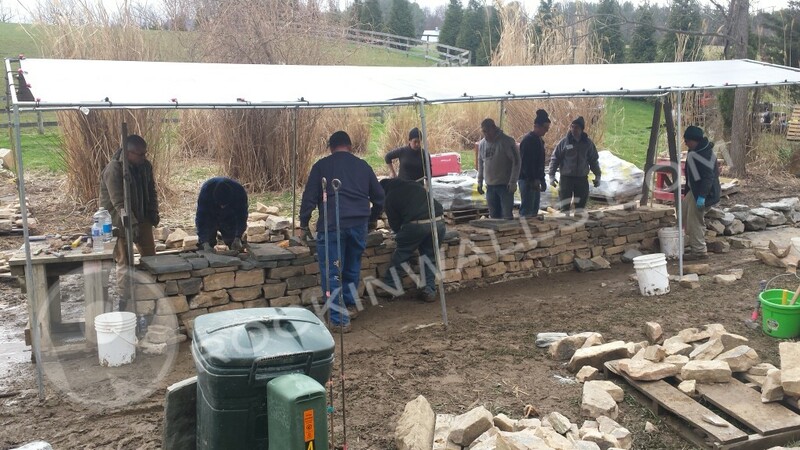 With arms length sections the group of 9 were split on each side producing a 22' Long x 4' High section of new wall. Besides the overwhelming volume of tools to try, clients also had the opportunity to try day to day equipment used on any jobsite. The Dingo shown here is just one of those many machines. With the confidence of operations and understanding of how to work smarter not harder. With this added experience one is more inclined to rent such equipment for their projects. Periodically the group was stopped to offer those words of walling wisdom from Neil and Mark. Along with stepping back to look at the wall and just take a water break. Often tasks not taken enough by excited to learn students. Neil R. takes some time to explain how and when many of these "Try Before You Buy" Tools, Hammers and Chisels should be used properly. What application is best fitting for each with what time of situation or stone. Tool safety, names, handling and maintenance for sharpening carbide tools was also covered. While no one tool will make you a great waller. Understanding Dry Stone Principals and Fundamentals will. Learning when and how the tools will work will assist you on your journey with stone. 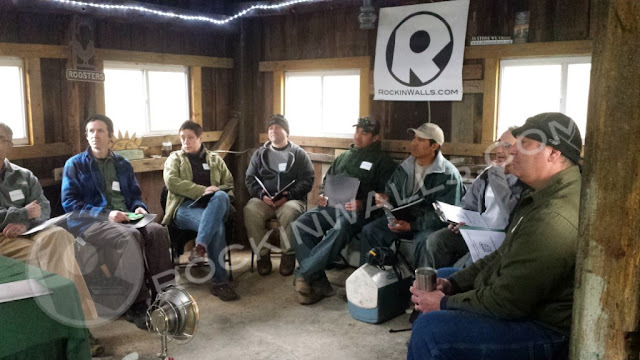 Mark explains and shows one of the building methods for foundation course. A below grade protruding foundation. 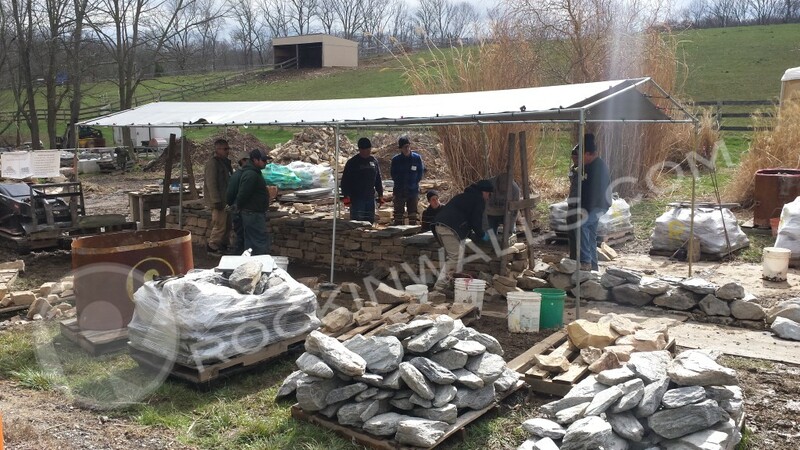 The team sets there first stones to the string line and below/to grade. 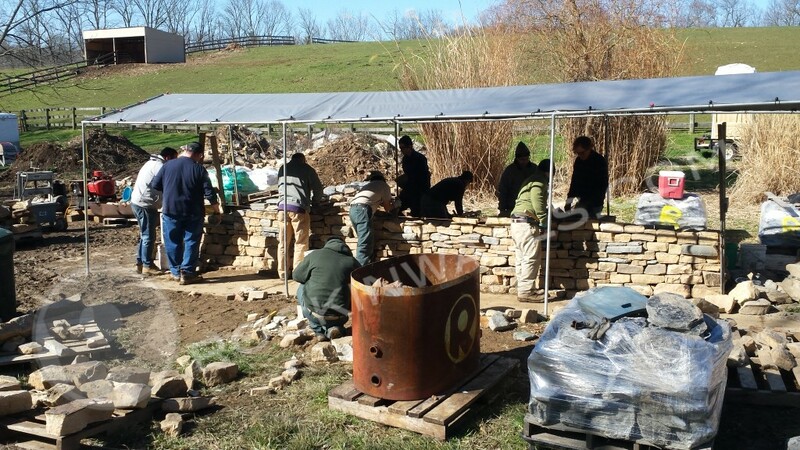 Much of the new wall section for this 2 day workshop had been built by previous 1 Day Foundation Building Skills/Practice workshops. 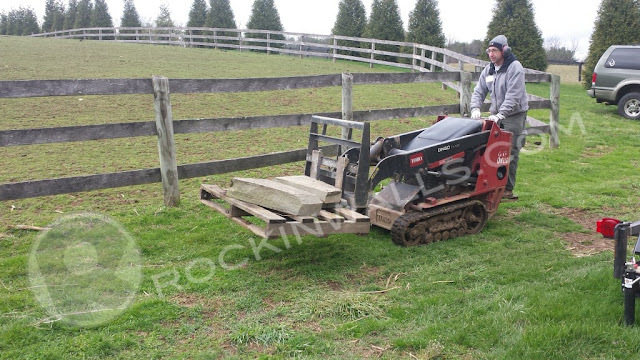 During this task students tried out the Rapid digger and Pave Tech's paver hammers to set each and every stone in earth. A good solid foundation is the success for a long lasting structure, dry laid wall, a home or even a relationship. Everything starts from the ground up. 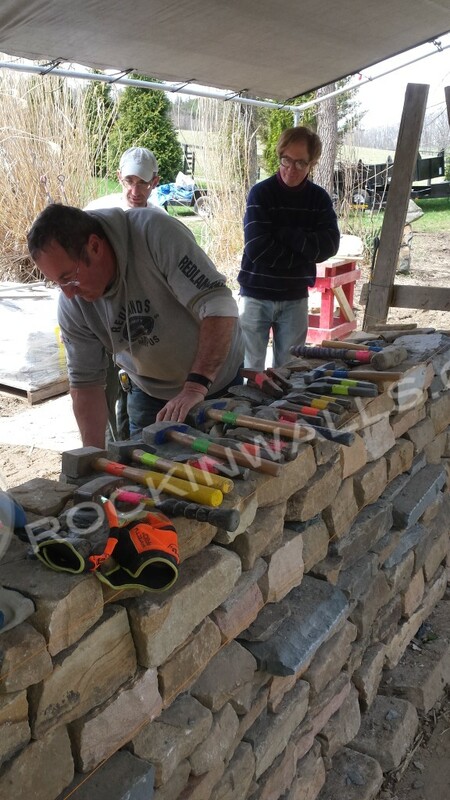 Neil showing half of the group how to set the vertical copes on the contractor wall from the day before. While the others half of the group tries their hand at building foundation. 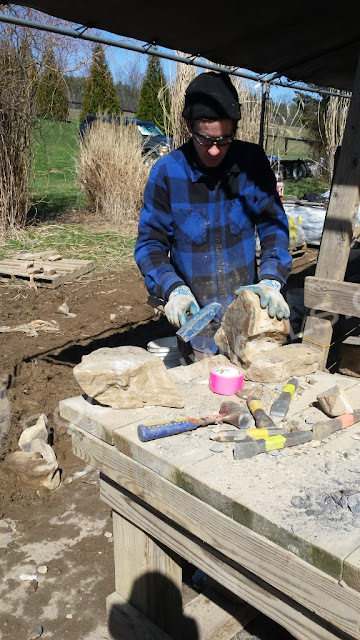 At knee height 18" +/- the tie stones go in set on 3' center stone to stone. The ties protrude 2"-3" from the wall these are about 27" total length blue stone. After 2 full days the group of 9 finished out the 22' of new dry laid stone wall. Well done team. 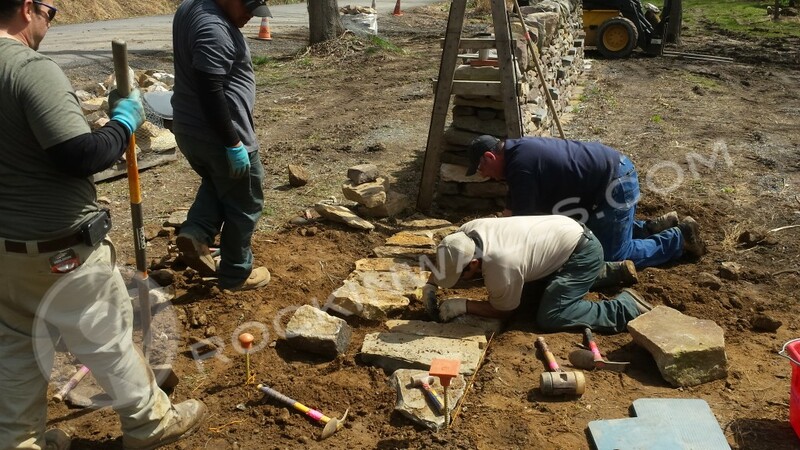 Proper Dry Laid Stone Construction Fundamentals?